Week three was packed full of great information from both guest speakers and our students. On Tuesday we had our first formal presentation. This presentation focused on the previous two weeks of research. To make things more interesting we had the pleasure of having Ed Benjamin one of worlds strongest e-bike advocates. Ed took time out of his heavy consulting schedule to give us his take on the e-bike market domestically and internationally. Ed’s talk gave the students a very through overview of the market and the differences between major markets such as Asia, Europe and the US. Our student found his talk full of useful information. We had a great exchange that led to the student presentations. The presentations were the first in a series of three that include Research, Conceptualization and Finalization. Each team focused on their market segment and took a user centered approach to their research. They interviewed individuals who were stakeholders in their area interest, conducted benchmarking exercises, technical aspects, ergonomic considerations and several other areas that were not required but brought new insights into our e-bike exploration. Each presentation captured the essence of the target markets and we had excellent exchanges between Ed and Bill Ropp. After the presentation Ed commented at the depth in which the students studied their markets and level of sophistication they showed in their presentations. We really got lucky to have two great experts in our audience that day. Thanks Ed! 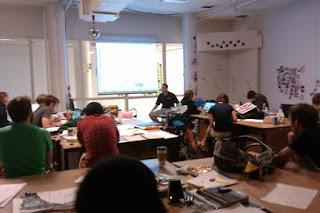 On Thursday of week three students were assigned to take all research and convert this information into design concepts. Also in this class we had our last scheduled speaker joined our class. Rob Cappucci from SRAM came to Cincinnati and gave us a great presentation. He covered the e-bike market as it relates to a component supplier. I have a feeling our students found this topic very interesting considering the following. Rob was prepared to talk for about 45 minutes and then cruise the room and review the concepts. Rob’s talk did take about 45 minutes but the Q&A took about another hour and half. The exchange was full of great information and the questions kept coming. If class didn't end at noon I think we would still be there. From this point on we will be pushing the envelope on e-bike design. Our students have the ammo they need and are cranking out some very interesting concepts. Next time I’ll post some images that will make you wish you were in our studio.